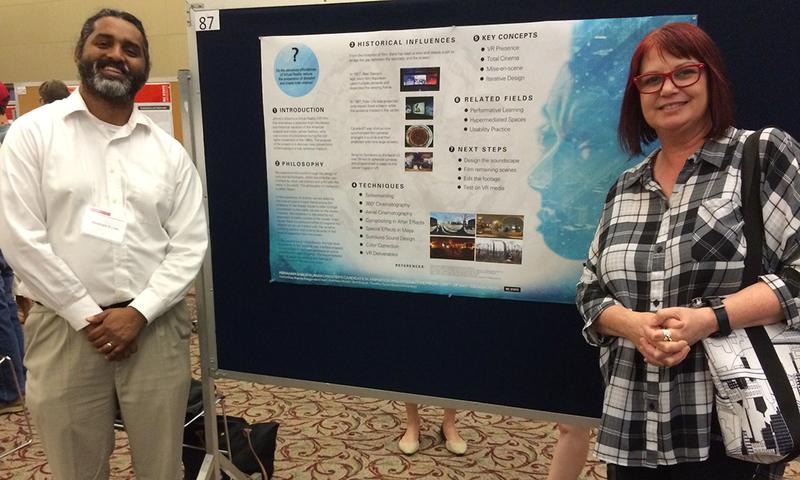 This week the Eleventh Annual Graduate Student Research Symposium North Carolina State University was held at the McKimmon Center. The purpose of this Symposium is to showcase the amazing work of graduate candidates whose thesis projects are available for viewing and presented for competition. Almost 200 candidates representing all 10 colleges within NC State University presented their posters and abstracts for review. 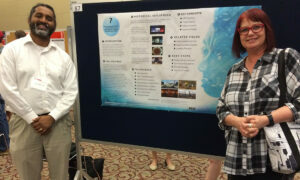 Thirteen students from the College of Design took part in this event. In the category of Design, these are the top three selected by the jury. 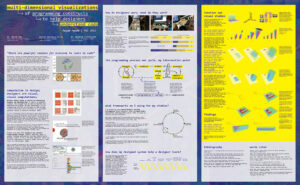 To follow is a list of each student, their graduate program, advisor, abstract, topic, and a preview of their poster. To counteract with the reduction of physical activity and for understanding the walkers’ preferences about the streets scape quality, the investigation examined, what are the attributes of route choice that may attract a commuting pedestrian to choose one route over another? This is novel methodology that eliminates the self-selection bias and also provides variations in settings. Until now, studies of the association between street attributes and route choice have mixed results. Some suggest that walkers consider the shortest route to minimize distance or walking time. Other studies found route quality to be a predictor of route choice. No studies have been identified that included both physical features and perception to achieve a clear transaction between environmental attributes and walking behavior. The focus of this case-control study (i.e., the case is the route taken, and those not taken are controls) is on micro-level street segments to explore how the urban design qualities of streets associated with transit users’ preferences in choice of routes. The primary data collected in light rail stations in Charlotte, NC. The subjective data gathered through an online survey questionnaire and the objective data gathered by using Pedestrian environmental data scan inventory tool. The study compared the number of times the segment was walked or picked by participants in survey. The betweenness value, which is a weighted accessibility measure, for this pair of segments was similar, but they could differ based on other attributes (i.e., predictors of conceptual framework like sidewalk width, the presence of certain land uses, and average set back). By observing how these systematic differences affect usage, for a given level of betweenness and walkability level, the findings reveal a strong positive correlation of shortest route with selecting route. Also, the primary findings imply that pedestrians will choose streets with the high level of attributes. The Sharing Economy keeps growing and is estimated to increase to half of the whole rental economy in 2025. According to the trend, Car-sharing systems also become one of the most common transportation methods and is anticipated to keep growing in the future. People who use car sharing systems, such as Zip Car, generally rent a car for just for a short amount of time and they do not have enough time to learn the function and controls of a car that they are not familiar with. 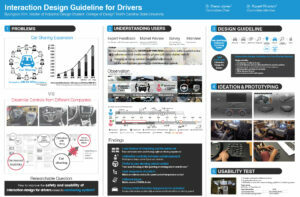 However, since current vehicles provide more functions and information than before, and each vehicle company applies different interaction design methods and locations of the controls into their cars, it becomes harder for the drivers who use car-sharing systems to control the functions that they need. These situations might distract the drivers who use car sharing systems and end up causing traffic accidents. 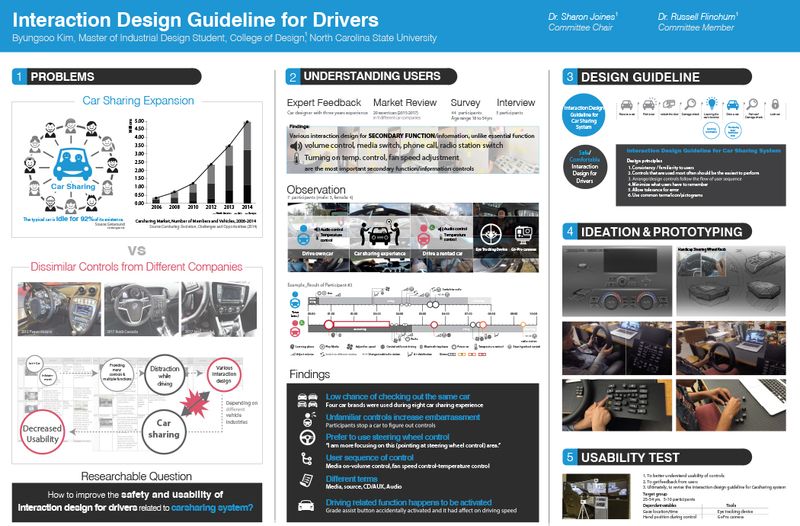 The purpose of this study is to gain a better understanding of the user experience while driving in order to develop universally applicable interaction design guidelines for designers regarding secondary car controls. Specifically, this study is focusing on the distraction/interaction of the driver with secondary controls in the car such as the radio, and heat / AC to inform the development of car interiors for car sharing systems. Historically, the spectatorial design of cinema has been a disembodied experience through a willing suspension of disbelief. Contextualized by the mise-en-scéne in each narrative frame and the juxtaposition of these frames through Eisensteinian montage, we semi- consciously transport ourselves into the constructed reality on the screen. But as André Bazin elucidated many decades ago, this phenomenology of the cinematic experience is not enough to achieve total immersion into the narrative because of the ontological separation between the spectator and the image. Over the course of cinema history, from Abel Gance’s Napoléon (1927) to the Montréal World Exposition (1967) to the re-emergence of Virtual Reality (VR), there has been a slow and steady push to reduce this existential space between the spectator and the image. Jimmy’s Ghost is a VR cinema study that dramatizes a selection from the literary and rhetorical prose of the prolific American essayist and orator James Baldwin, who was a voice of conscience and empowerment during the civil rights movement of the 1960s. The implications of this interactive study will be threefold. First, it will expand the spectacle of cinema into both narrative time and space. Within this redefinition of the cinematic language, the construction of the visual narrative will move away from Eisensteinian concepts, and move towards the compositional fi lm theory of Andrei Tarkovsky. Secondly, the physical act of immersing in the hyper-mediated VR space through the Oculus Rift glasses will create authentic feelings of being present in the narrative space. And thirdly, as precedent research indicates, the interactivity of the medium will create more empathy and engagement with the spectators, and will deliver a proof of concept for future initiatives in the digital humanities. While many contemporary individuals lives are hectic and meal preparation falls to the bottom of their priorities, in the meantime some other people want to cook but have nobody to share with. 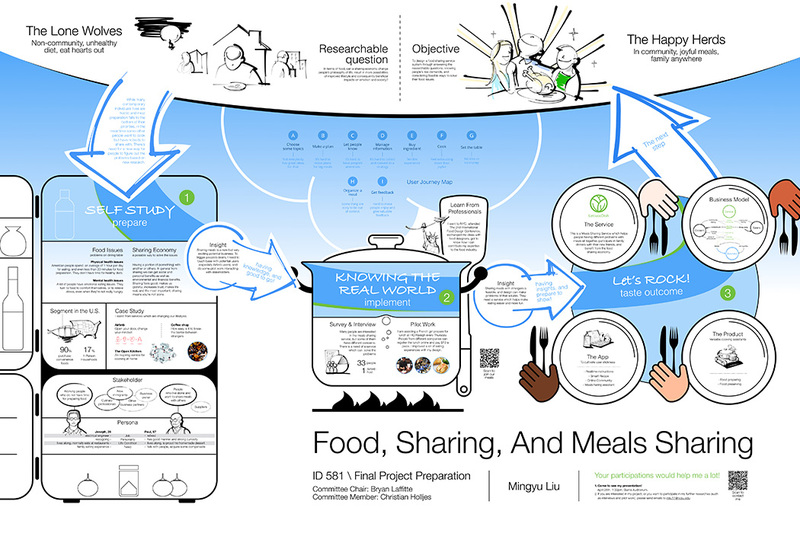 My objective is to design a new service through answering the researchable questions, knowing people’s real demands, and considering feasible ways to solve their food issues, then make a dreamland for the “lone wolves”, bring them in communities. In the project I’ve identified the segment by implementing market reviews and primary researches, moreover I have been doing pilot work for couples of month. 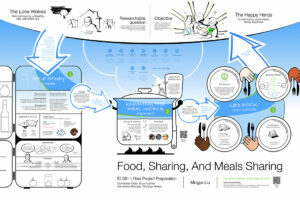 I found that sharing meals with strangers is feasible, and design can make problems of that soluble. There is a need of new ways that help them eat more healthy, feel more satisfactory, and utilize well the resource gotten from communities. After making business strategy I created a genuinely potential and creative service. It will be a meals sharing service, which helps people having different problems with meals sit together, benefit from the food sharing economy. They would participate in dinners with their new friends, have joyful meals, and feel family anywhere. Today more than ever, there is a need for designers to learn programming to expand their existing toolset to allow them to design for future applications of technology. However, the way in which programming is typically introduced using syntax based instruction has not proven to be as effective for designers. As visual thinkers, design students are more comfortable with working in space rather than a text-only environment. This thesis aims to lower the barrier of entry to programming for designers and visual thinkers. The investigation explores the design of a Three Dimensional Visual Programming Language (3D VPL) that introduces college-level design students to programming. This 3D VPL lets them manipulate code blocks in three-dimensional space to build their application. Ways of defining mathematical functions in space are also explored. Serving as the teaching assistant for an introductory programming class for designers, I was able to observe design students tasked with learning programming. This observation served as a guide for my explorations and studies. These explorations also establish much of their foundations from research through design and making. During classroom activities, a visual approach to explaining programming concepts was met with a better response than a text based or oral approach. Conversations with the students in this class indicate positive outcomes of using a visual approach to introduce programming, and the design of the system is under way dependent in part upon a continual interaction with the students. Writing is a complex process that involves juggling numerous constraints, setting goals, and moving back and forth between producing ideas and producing text for those ideas. Text generation is a highly codified process compared to idea generation. Cognitive scientists including Linda Flower, John Hayes and Peter Wason have suggested that novice writers often confuse idea manipulation with text manipulation, which results in rules of text generation interrupting idea generation at an early stage. This interference results in chaotic plans and incoherent first drafts. Externalizing ideas and structuring them into a plan is an important strategy for novice fiction writers, who often do not have a developed process for writing or concept development that they can depend on. Many novice writers discover early on that in spite of applying all the learned techniques correctly, the vivid story in their mind becomes a washed-out version on paper. Further, fiction is a large category within creative writing consisting of various genres, forms and styles. Current writing tools facilitate text generation more than capturing and manipulation of ideas, when both are equally important components. 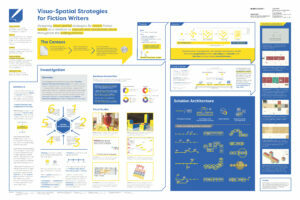 This study aims to investigate the idea generation component of writing through the use of visuo-spatial strategies. 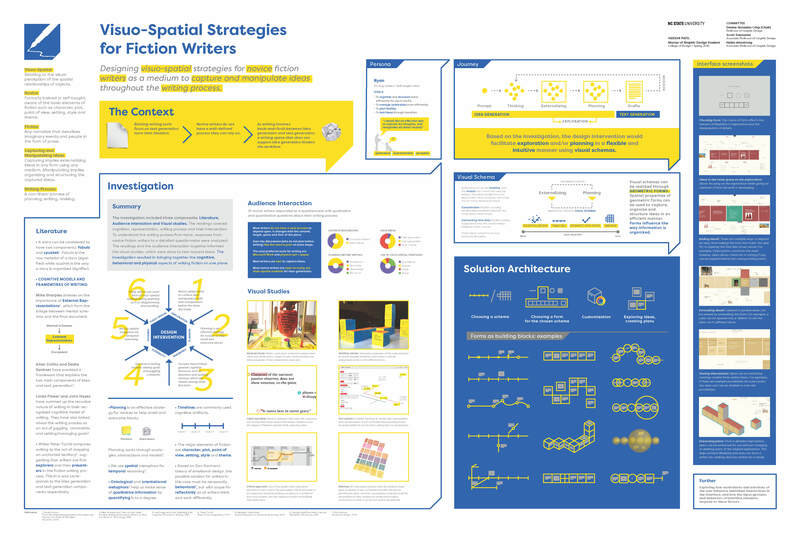 These visuo-spatial strategies as part of an interface are intended to allow creation of intuitive and flexible plans, based on common attributes of fiction such as temporal and causal relationships between ideas. The strategies will manifest through digital writing tools that aid in facilitating visual manipulation of captured ideas, as well as provide customizable functionalities that allow sorting and testing ideas through iteration. The further a company is from the final user in the value chain, the harder it is for a company to view their products in connection with the final user. It can also mean a company does not understand the brands who seek to connect with the final user. This is particularly true for raw material suppliers who are near the beginning of the value chain. The company’s ability to continually innovate could be limited without knowing the value proposition to the final user. The inability to communicate the value of the company’s products could make a meaningful discussion with partners and customers difficult, make credibility challenging to establish and lead to missed opportunities. Therefore, the use of industrial design and forecasting methods could be a means of sparking purposeful discussions with those who make strategic decisions inside and outside of a company. Specifically, the study will demonstrate the need for being informed directly by the final user when the company wants to engage with a brand. Since raw material suppliers need time to develop solutions, understanding the final user’s needs will be used to develop forecasts. The study then will demonstrate how to translate knowledge into information useful for technology, material and business strategy. Lastly, the study will demonstrate how industrial design can help strategists to sell their ideas and reach the market through tangible prototypes, research insights, and product experiences. Thus far, the study has determined initial user research is needed to meaningfully define the questions to be answered by the material solutions developed. It was also found that analysis of the insights and translating into forecasting should be given more space and time within project planning to create a robust problem statement. Lastly, artifact design should focus on a material experience being demonstrated through a product abstraction. Up to this point in interaction design, the focus of attention has been on usability and the built structure of the digital artifact. Aesthetics often are viewed with lesser importance as a surface component. The literature in Human Computer Interactions is moving towards the idea that aesthetics aren’t just the way that something looks or behaves, but is important to how users understand and experience a product or artifact. More specifically, HCI researchers have developed theories where combinations of interaction attributes, for example movement speed, concurrency, and expectedness, come together to form an Interaction Gestalt. This combination of attributes as a gestalt forms emotional qualities to the user. These qualities are inherent to interaction, and aren’t possible with physical artifacts. For this reason, both study and practical implementation of Interaction Gestalt has remained in a more neutral, clinical setting of HCI research. The research that I am doing seeks to take the principles of interaction gestalt and apply real world content and graphic design principles to see how these theories hold up in actual use. Coming out of the research, the aim is to have a series of case studies that are clear and usable for future practicing interaction designers to apply. 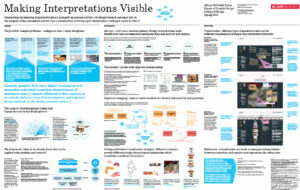 My research methods are mainly through research by design where I am building usable prototypes of data visualizations obtained from Tate Museum Collection Data and systematically applying the interaction attributes as variables that could potentially create emotional qualities to the visualizations. 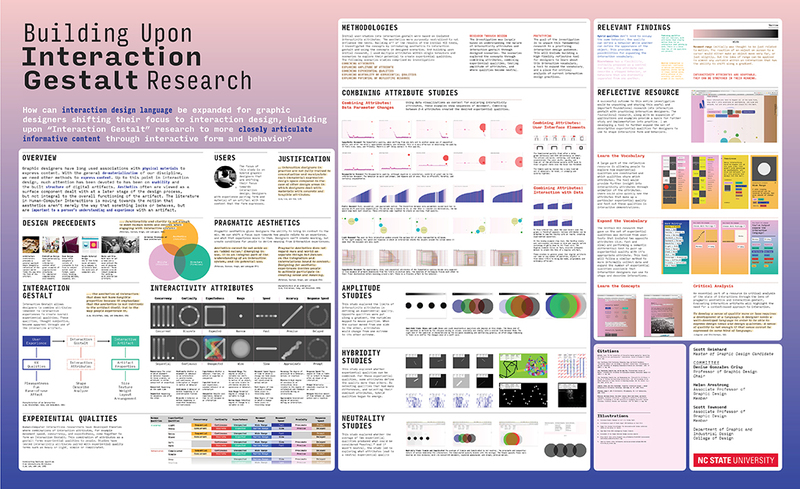 At this point, early findings are that combinations of interaction attributes are a useful way of creating emotional qualities in interactive visualizations. My continuing studies will look at how affecting various elements of the interaction and the degree to which I affect the variability of the attributes changes the feeling that is created in an interactive experience. 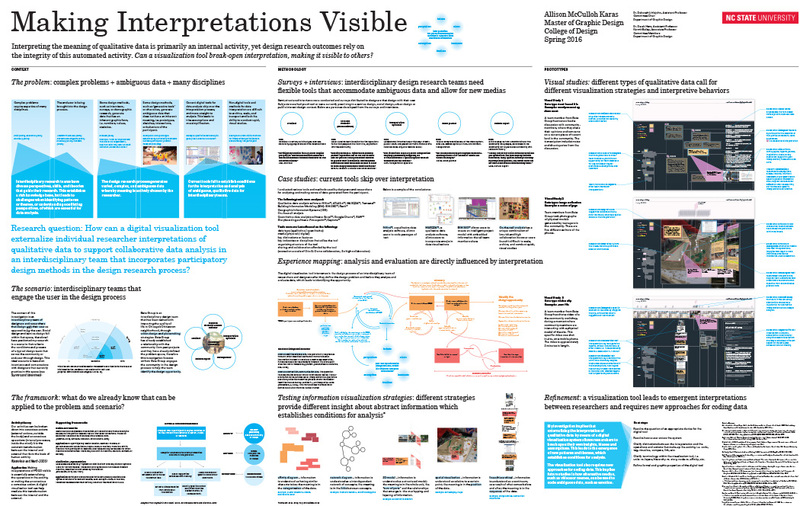 This poster presents partial findings of a study that explores how empathy is expressed and developed by undergraduate students exposed to two different industrial design studios during an academic semester at a public research university. In the Design field, empathy—the ability to feel, recognize, and understand another’s thoughts and feelings—is considered essential for designers to acquire a deep understanding of the users in order to develop design solutions that meet their needs, and expectations. However, it has been reported that since the year 2000 there has been a decline in empathy among American college students. 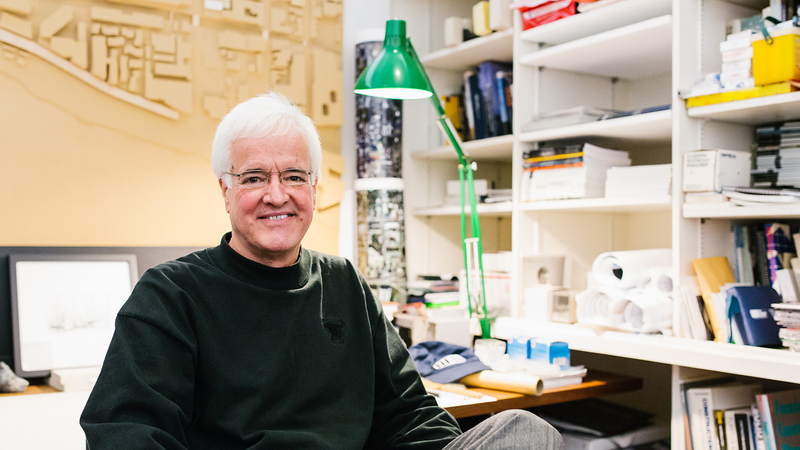 Additionally, despite the importance of this ability in the design field, there is a lack of empirical research exploring how empathy is approached and promoted in design education. 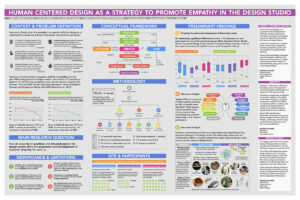 As a consequence, the purpose of this study is to understand how empathy is expressed and developed by undergraduate industrial design students, through the exploration of the methodological, pedagogical and curricular conditions to which they are exposed in two different instances of design education. 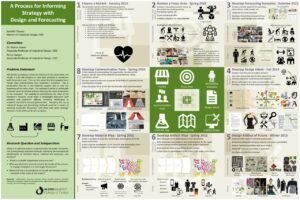 A total of 33 industrial design students in two different design studios participated in this study, which was conducted using a simultaneous mixed methods design driven by its qualitative component (QUAL+quan). 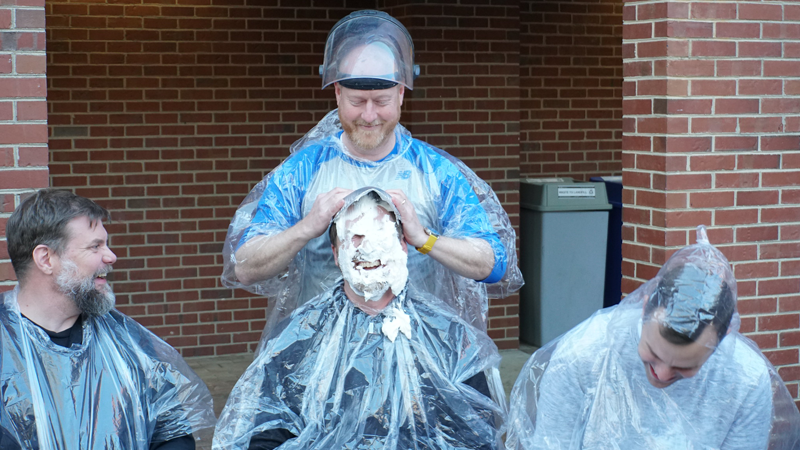 From a qualitative approach, this study implemented an ethnographic strategy. Data was collected using non-participant observation, semi-structured interviews, discourse analysis, document analysis, and artifact analysis. From a quantitative approach, the study implemented quasi-experimental and correlational strategies. Data was collected using questionnaires and surveys. For data analysis, a combined strategy was implemented, utilizing techniques such as transcriptions, coding, memoing, correlations, and analysis of variance. 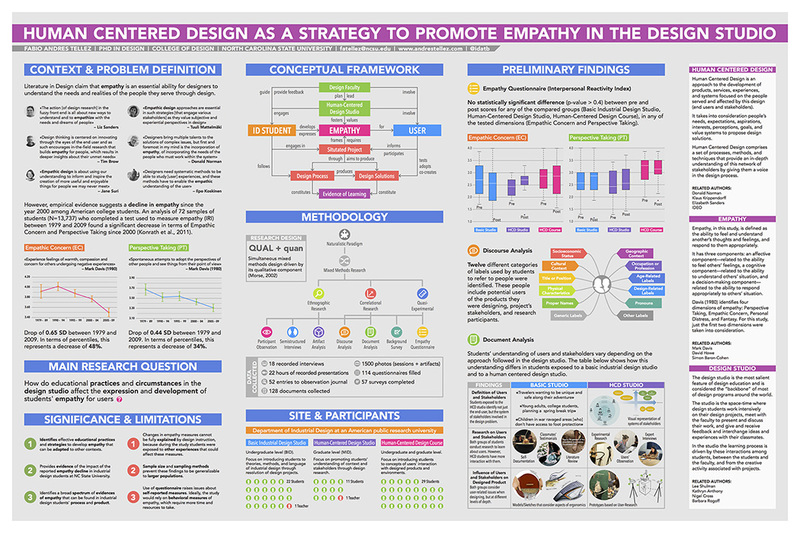 This poster reports a section of the findings, where it is shown how the use of human-centered design methods in the design studio plays an important role in promoting the expression and development of students’ empathy. Historically, representations of motherhood and home tend to privilege events having the status to be remembered (birthdays, first days of school, holidays, etc.) How the self is portrayed and mediated in this context is often associated with domestic roles and connected to cultural expectations. This research explores the less visible elements of those representations by examining domestic dust and debris as autobiographical narrative. Using household erosion as primary subject matter, an installation of photography, printmaking, video and sound will be produced to communicate a self-story addressing motherhood, personal history and power. 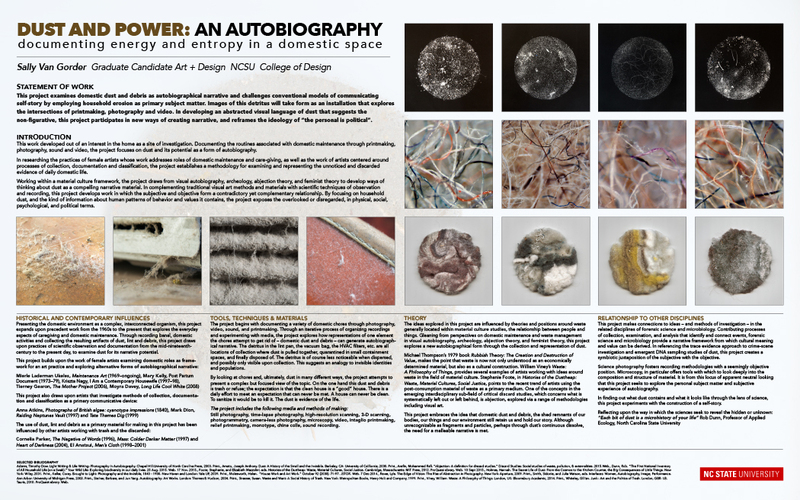 The research conducted to frame the creative work was guided by the following questions: What aspects of autobiography can emerge through visual depictions of domestic dust? How does the unwanted breakdown and waste of everyday life generate insight into personal history? 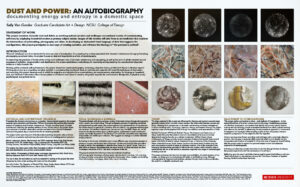 In what ways can the collection and archive of domestic erosion reveal an understanding of a larger whole? How can the gathering and organization of dust in the home express autobiography and attribute power to the storyteller? A methodology for examining erosion in the household was established by exploring the practices of artists whose work addresses domestic maintenance and care-giving, examining scientific methods of visualization and investigating systems of collection, documentation and classification. 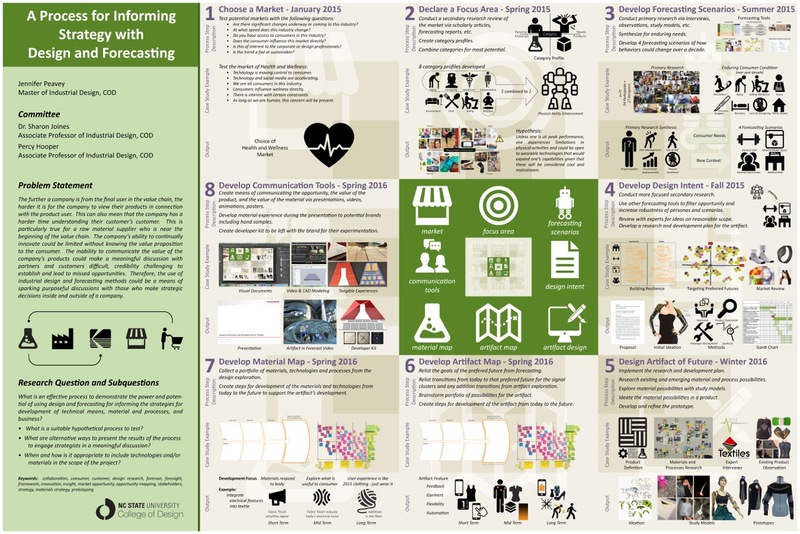 This research contributes to current dialogues regarding the experimental documentary form of visual autobiography, the relationship between artistic process and scientific method, hybrid digital and handmade production processes, and domestic social structures. In 2006 the term “Colony Collapse Disorder” (CCD) was coined to describe the disappearance of western honeybee (Apis Mellifera) colonies in North America. Recent studies have calculated that more than 10 million hives were lost to CCD from 2006- 2013. One of the major causes of this behavior is the Varroa Mite, an external parasitic mite that attacks and causes diseases to honeybees. 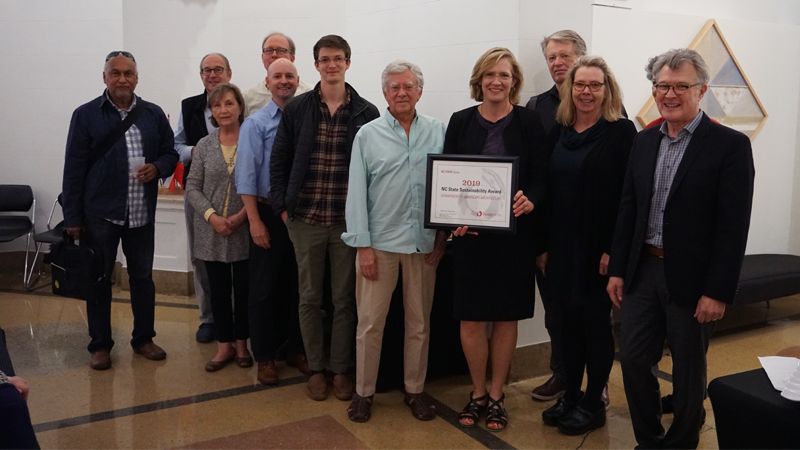 This project is intended to look at how we can alleviate the decline of the western honeybee through educational community efforts, scalable hive designs, and focusing on the removal of Varroa Mites within the beehives. It’s imperative to understand and engage the experience of the beekeeper to develop guidelines for community participation and acceptance of beehives locally. By understanding how a colony works together and supports a certain amount of space the project will work to create scalable hive designs for breadth and compactness. Out of 107 people surveyed, 70% stated that they would want to own a bee hive to help with the Colony Collapse Disorder. However 52% of the people said that they would not want to own a bee hive because they are not educated on keeping bees. This is a great opportunity for design to relieve the stressful process of keeping bees and adhere to the education of beekeeping; a market of great potential. By focusing on the user experience of the beekeeper this design project will translate the expert’s process to guide a beginner user from start to finish on the process of beekeeping. Handmade textiles have been produced for centuries, reflecting place, people and culture, but they have not always been accessible to consumers. A distinctively imperfect mark of the hand with the desire to produce unique originals inspires utilitarian goals to research and explore production techniques for printed and woven textiles. 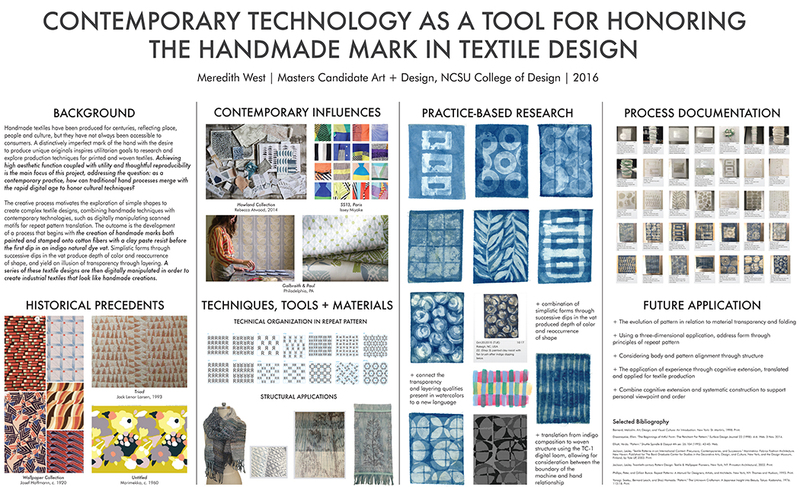 Achieving high aesthetic function coupled with utility and thoughtful reproducibility is the main focus of this project, addressing the question: as a contemporary practice, how can traditional hand processes merge with the rapid digital age to honor cultural techniques? 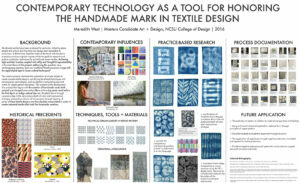 The creative process motivates the exploration of simple shapes to create complex textile designs, combining handmade techniques with contemporary technologies, such as digitally manipulating scanned motifs for repeat pattern translation. The outcome is the development of a process that begins with the creation of handmade marks both painted and stamped onto cotton fibers with a clay paste resist before the first dip in an indigo natural dye vat. Simplistic forms through successive dips in the vat produce depth of color and reoccurrence of shape, and yield an illusion of transparency through layering. A series of these textile designs are then digitally manipulated in order to create industrial textiles that look like handmade creations.